The Defence Minister, speaking at the beginning of a tour of Lebanon and Israel, said increased tension could lead to involvement of more peacekeepers at Golan Heights. Niamh Fleming-Farrell reports from Beirut. 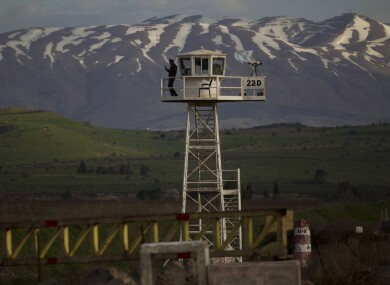 A UN peacekeeper from the UNDOF force stands guard on the border between Syria and Golan Heights last Friday. A UNITED NATIONS request for a larger international military presence on the Syria-Israel border is something the Irish government would give “serious consideration,” Defence and Justice Minister Alan Shatter has said. Speaking in Beirut on Sunday at the outset of a week-long official tour to Lebanon and Israel, Shatter commented that current UN observer mission in the Golan Heights “may have to be beefed up, if that border becomes a focus of tension”. The United National Disengagement Observer Force (UNDOF) has been mandated to maintain a ceasefire between Israel and Syria in Golan since 1974. According to the Irish Defence Forces website, Ireland presently has a small number of troops deployed in Golan through its 14-soldier commitment to the United Nations Truce Supervision Organization (UNTSO) which supports UNDOF in the area. For much of the past four decades a relative calm has prevailed in the Golan Heights, but two years into the uprising in Syria and with violent civil conflict raging, the zone has become increasingly unpredictable. Last week 21 Filipino peacekeepers were abducted in the area by rebels from the little-known Yarmouk Martyrs Brigade fighting Syria president Bashar Assad and held for four days. They were freed Saturday. The precise reason for their capture remains unclear. Meanwhile, Israel has recently increased military presence on its side of the UNDOF patrolled area, and Jerusalem has reportedly considered building a buffer zone within Syria in an effort to address the underlying perceived threat from Syrian unrest within Israel. Of course there’s been some incidents within the vicinity of the border involving some of the different groupings who are engaged in the conflict. He added that he had “already had some discussions” in Lebanon about the situation in Golan and that he will receive a briefing from the UN perspective while in Israel. Shatter has previously signed off on Irish participation in a UN mission to Syria since the conflict started. Six Irish peacekeepers joined the United Nations Supervision Mission in Syria (UNSMIS) last summer. Commencing in April, UNSMIS was charged with monitoring the cessation of violence by both the rebels and the regime in the Middle Eastern state. Its initial 90-day mandate was extended for a further 30 days, but the mission was finally terminated on 19 August when fighting became too intense for the force to proceed with its sanctioned role. More recently, the minister committed to sending Irish troops to Mali, where French-led forces entered in January to restore centralised control of the African state after rebels seized its north last April. Eight Irish soldiers are set to join the EU Training Mission in Mali (EUTM-Mali), which will be responsible for offering military training and advice to the Malian Armed Forces. Ireland presently has approximately 400 peacekeepers deployed with a joint Irish-Finnish UNIFIL (United Nations Interim Force in Lebanon) battalion in south Lebanon. Shatter presented UN medals to members of the battalion while in Lebanon on Sunday. Niamh Fleming-Farrell is a Beirut-based journalist. Email “Shatter: Ireland would consider sending more soldiers to Syrian border”. Feedback on “Shatter: Ireland would consider sending more soldiers to Syrian border”.